Established in 1959, Harris Walton are one of the World’s largest manufacturers of British Standard Eyebolts (to BS4278) with the capabilities to manufacture and export a wide variety of customised lifting gear equipment, links, rings and drop forgings to both UK & overseas markets. Due to the manufacturing flexibility of its wholly owned forging and machining division, Harris Walton can also provide a fast turnaround of bespoke ‘specials’. In-house testing facilities and test certification procedures allow lead times to be greatly reduced. We are one of the few remaining companies using both traditional manufacturing techniques combined with advanced robotic equipment with full in-house testing and quality certification facilities. For over 45 years, Harris Walton have gained a reputation around the World as one of the leading Lifting Gear specialists. Our customers come from as far apart as Scandinavia, Far East, Europe, Australia and New Zealand. 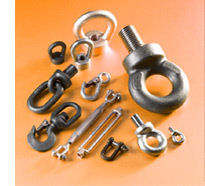 We provide a range of stainless steel Eyebolts and Bownuts to the Lifting & Rigging, Automotive, Marine, Oil & Gas and Structural Fabrication Markets. Wire Rope, Webbing and Chain Slings can also be manufactured to order. Harris Walton are also appointed agents for Crosby Europe. West Midlands, DY5 1TR, England.